Your voteshave set the bar very high with these five sound bar nominations, and now it’s time to narrow down a winner. Check out each nominee below and then cast your vote in the poll. SONOS is the standard for ease of use when it comes to wireless audio. Simple, beautiful quality for a price. It can also (optionally) pair with other SONOS speakers or the SONOS Subwoofer for true surround sound. The Playbar was one of our most popular items during Black Friday last year, and it got even better with the addition of Deezer’s Lossless Music Streaming Serviceand the waiving of the Bridge requirement. Here’s the Gizmodo review. 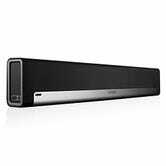 For those that want the convenience of a sound bar while sacrificing as little true surround as possible, or for anyone who just wants great sound on the cheap, the VIZIO 5.1 is a killer deal. The two satellite speakers connect to the wireless subwoofer, giving you left and right rear surround channels without running wires all the way around the room. It comes in 3 sizes, and Amazon regular runs an additional $20 discount for Prime members (free trial here). I’m a former owner, and big fan of the VIZIO. Several models of the Sony HT-CT series placed highly in round one. We’ve chosen to link to the latest model, especially because it’s available for the same price as the previous one. 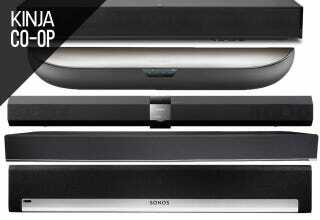 The Sony HT-CT770 brings a wireless subwoofer, bluetooth, NFC, app controls, and 3 HDMI ports, plus a great look. If you like what the 770 has to offer but are priced out, check out the other models in the line. The ZVOX 580 isn’t a sound bar, but it is an interesting product that 1) serves the same purpose, and 2) Wasn’t going to come up in any other Kinja Co-Op. The ZVOX sits under your TV, rather than in front of or near it. It includes five high-performance speakers and dual 6.5" powered subwoofers for window-rattling bass. The ZVOX PhaseCue virtual surround sound system creates three-dimensional sound without the need for multiple speakers throughout the room.